​It’s hard to believe with all the snow still blanketing Central Pennsylvania that the 2016 racing season is only just a little over a month away. For Jake Jones and his team, it has been a busy off-season getting their equipment ready for an all-out assault on the Susquehanna Speedway track title. After spending the last six years calling Williams Grove Speedway their home, the team switched gears and will race regularly at the Susquehanna Speedway which is under new ownership and management for 2016. The team certainly knows their way around the York Haven, Pennsylvania 4/10 semi-banked speedway as Jake won the 2009 track title in the last season they raced there on a regular basis. The team is also pretty excited to announce that Berkebile Oil Company and Snap21.com has joined the team for 2016. Established in 1954, Berkebile Oil has been known throughout the automotive industry to have a wide variety of quality products. With over 60 years of development built into their formulas, Berkebile Oil products are a superior product for any and all vehicles. The Somerset, Pennsylvania company takes pride in knowing that their products are manufactured and packaged right here in the United States. Known for not only great products but outstanding customer service, Berkebile Oil prides itself in quick turn-around times to its distributors which in turn can be passed on to its customers. For more information on Berkebile Oil’s vast line of products, check them out at www.berkebileoil.com . “This partnership with Berkebile Oil was a win/win situation” said driver/owner Jake Jones when reached Monday night at his business. “I have used their products with a lot of success over the past couple years and now it’s an honor to be a part of their team. Even if they were not a sponsor, I would tell people what great products they have, just from my experiences. I look forward to a long relationship that not only helps our race team, but also gives them some brand awareness in our area and the markets we race in” added Jones. Also new to the team is the nationwide automotive dealer review site Snap21.com. The simple-to-use online site allows you to review and rate automotive dealerships no matter where your car, SUV or truck was purchased. It lets other consumers know just how good or bad your experience with any certain dealer was. Each review is accompanied by a picture of the customer, so when you read their corresponding review you know it’s for real. Before you purchase a new vehicle, log on to www.snap21.com and search for dealers in your area and read about their previous customer’s experiences. “We are honored to carry the Snap21.com logo on our car” stated Jake. “It is a great tool that helps the buyer really research car dealers before they purchase a car from them. It also puts pressure on the dealers to work hard for their customers and provide a great experience to them because they know that a good rating and reviews equal more customers” added Jones. The team will debut its new 2016 LazerX late model this weekend at the Motorama show in Harrisburg Pennsylvania. The show is open both Saturday the 20th and Sunday the 21st with entertainment for young and old alike. The car will be displayed all weekend at the Miller’s Racing Parts booth so stop by, say hello and check out the colors “The Jones Gang” will be sporting this year. With the Williams Grove Saturday Series closing its doors at the end of last year, plans are for Jake and the team to compete weekly at Susquehanna with trips to Lincoln, Port Royal, Hesston and Hagerstown when work and finances allow. Susquehanna is under new ownership and with the speedway and grounds getting a complete face lift, make plans to spend your Saturday nights with The Jones Gang. “I am really excited about this year” exclaimed Jones. “We had a great couple years at Williams Grove finishing in the top 3 in points with the exception of last year when I had to sit out the second half of the year with injuries from the Hagerstown wreck last July. Because of that we didn’t get to race as much as I’m used to then when we did come back the car, although it was fixed, was never really right. I am looking forward to trying this new piece out and getting back to Susquehanna. Scott and Kolten are doing amazing things to the facility to bring it back to prominence and I think it will be an awesome year. I have won feature races at seven different speedways and Susquehanna has always been one of my favorite tracks in the past. It’s awesome to see the new ownership team bring it back from the dead. Brian and the team have worked hard all winter on our equipment and I am pumped up to get racing” stated Jake. Keep up to date with all of the Jake Jones Racing team news on his official web site at www.jakejonesracing.com. 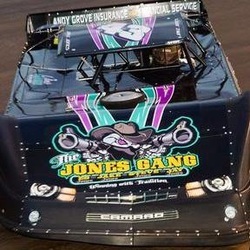 You can also follow JJR on Facebook at Jake Jones Racing. Jake Jones Racing would like to thank all the team’s Marketing Partners for 2016: Miller’s Racing Parts, Blazer’s Auto Body, Keystone Valley Ranch, K.R.S. Graphics, Berkebile Oil Company, AllStar Performance & D&D Septic with product help from: HTMA/Hoosier Tire, Integra Shocks, Baker Outlaw Carburetors, Snap21.com, JLE Electric, Team Dirt Dog Apparel & Bernheisel Race Components. The standard techniques for combating winter weather and road conditions can cause serious damage to equipment and vehicles and we'll tell you why. How does rust form in the first place? Rust formation on metal begins to happen almost instantly when water makes contact with the metal. Water mixes with chemicals, mainly carbon, naturally found in the air and creates a mild acid that chemically breaks down the metal. Parts of the broken down metal then mix with oxygen in the water to form visible rust. So, two things are actually happening when damage is caused to metal parts on a vehicle, the first is that a mild acid is eating away at the metal, and parts of the metal that remain, on a chemical level, are mixing with oxygen to form the visible rust and oxidation that owners hate to see. This process occurs naturally with most metals at a slow rate, but there are certain situations where the process can be rapidly sped up. For example, when water mixes with a chemicals other then those naturally found in the air it forms a much stronger acid. This acid can also last much longer on a surface prolonging its damaging life span. Two chemicals that promote the formation of a strong, vehicle damaging, acid are Rock Salt (Sodium Chloride) and CMA (Calcium Magnesium Acetate). These are also the two most common winter roadway treatment chemicals used across the nation. These chemicals are used in roadway treatment because they reduce the freezing point of water. While this may be very effective at preventing icy roads it is very bad news for a vehicle. When these chemicals are used they create "slush" on roads that is a mixture of water and the chemicals. This "slush" comes in contact with your vehicle and sticks to it. Even after the water has dried the chemicals remain, so that any time water comes in contact with your vehicle the acid forms again and begins eating away at your metal parts. Taking the necessary steps to protect against rust and corrosion is vital to the longevity of a vehicle. There is no better protection then Protection First Class from The Berkebile Oil Company. 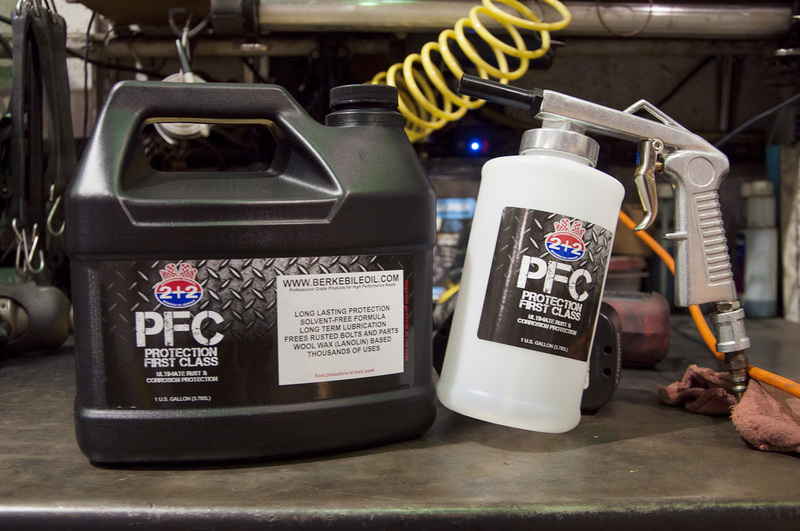 Applying Protection First Class and regularly washing road chemical build up off of vehicles will stop rust and corrosion causing acids to eat away at a vehicle's metal parts. Protection First Class provides a far superior level of protection then other products. It is non-toxic, solvent free, and safe to use on most painted metal, unpainted metal, rubber, synthetic rubber, and plastic surfaces. When tested in a Salt Fog booth, to simulate a corrosive environment, Protection First class protected nine times longer then other products. It prevented rust formation in a steel plate exposed to a constant 5% salt fog for over 1,500 hours, or nine weeks! Protection First Class's lanolin based formula works by penetrating into the pores of a surface and covering it with a clear wax film. The film never completely dries out, is flexible, and self healing. The wax film blocks out and prevents moisture, dirt, and mixtures of corrosive acids formed by road chemicals from coming in contact with the surface. Since the acid formed by water and road treatment chemicals is prevented from coming in contact with the metal, the metal doesn't breakdown, preventing rust and corrosion from taking place. This makes Protection First Class an excellent vehicle undercoat. It sprays on evenly and is a non permanent application. Its clear wax film will not hide mechanical problems or trap moisture like a typical rubberized undercoat and can be reapplied as needed with only an undercoating gun and an air compressor. Protection first class also works great to prevent locks from freezing, lubricate any moving part, protect battery terminals and electrical connections. It is available in a 15 oz. aerosol can and as a liquid in 1 gallon, 5 gallon, and 55 gallon quantities. Berkebile Oil Introduces their New HEAVY DUTY Products! Berkebile Oil Prepares for Vegas Convention! Berkebile Oil will be participating in the Automotive Aftermarket Products Expo (AAPEX), in Las Vegas, Nevada, from November 5th-7th, 2013. The Expo will take place at the Sands Expo Center. Click on the blue banner link for more information about the Expo! And be sure to visit our booth while you're at the the Expo! Booth number, 4158!